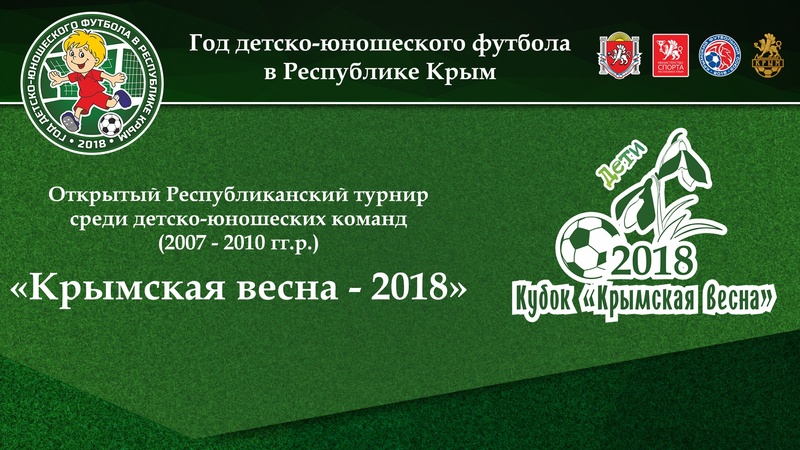 Open Republican tournament "Crimean spring-2018" conduct among children and youth teams of 2007, 2008, 2009 and 2010 year of birth, in the period from March 8 to 11 2018. The tournament will be held in full accordance with the football rules. Boys of 2009-2010 year of birth – March 10-11 in Yevpatoriya city. Tournament scheme approved at the technical conference will be drawn up depending on the number of teams. Competition Committee reserves the right to make changes at tournament scheme during the competition. Open Republican tournament "Crimean spring-2018" conduct within the framework of the Children and Youth`s Football Year in the Republic of Crimea. Logo of the tournament "Crimean spring-2018"